Justin Shaulis created this illuminated vignette to represent Lucy’s life and Italian adventures. When I saw the expressive twin spaces Justin Shaulis created as one of American Standard’s 2015 DXV Design Panel participants, I knew I had to feature him for two reasons: the sensual storytelling he achieved within the spaces he designed and the novel he chose as his inspiration, A Room with a View by E.M. Forster, which has always been one of my favorites. Justin created this moody vignette to represent Cecil’s constricted life and point of view. The character of Cecil—a quintessentially stiff Brit emblematic of his prim and proper era (and the man to whom Lucy is betrothed)—inspired the masterful masculine milieu shown above. Anchoring the vignette is a deep bathtub—the Lyndon Freestanding Soaking Tub, which is surrounded by lavish accouterments and adorned with a lush landscape oil painting hung above it, set within an ornately grand period-appropriate frame. Justin references E.M. Forsters fabulous story in the space inspired by Cecil by including the novel. SH: Who introduced you to E.M. Forster? JS: In high school, I developed a fascination for period films, more out of escapism than pretension. Luckily, the video rental shop had a great collection to choose from. Merchant Ivory introduced me to E.M. Forster with their renditions of A Room with a View, Howard’s End, Maurice and Passage to India. What hit me at the time—and looking back now—was the casting of such great actors. 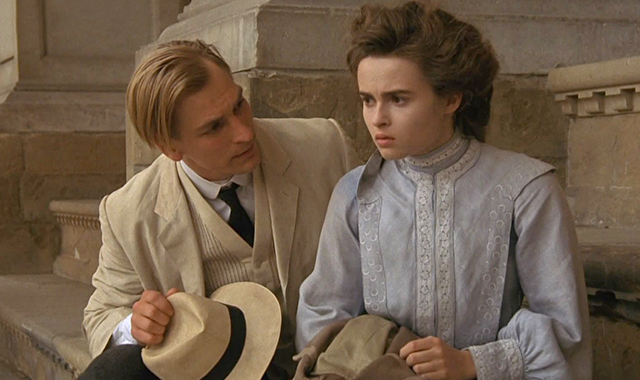 Most novel-to-movie productions don’t work as well as the books; they seldom translate when there is a lack of understanding for the subject matter, and here is where I feel Merchant Ivory excels! SH: Tell me what you remember about your first introduction to the story. JS: I recall being in the family room with my friend Carrie, getting caught up in how lush the set design and costumes were. Julian Sands, Daniel Day Lewis, Helena Bonham Carter and Maggie Smith were cast as the main characters, and their portrayals of these restrained Edwardian people captivated me. They were able to convey so much with a furtive glance, a turn of the head or a sip of their tea. 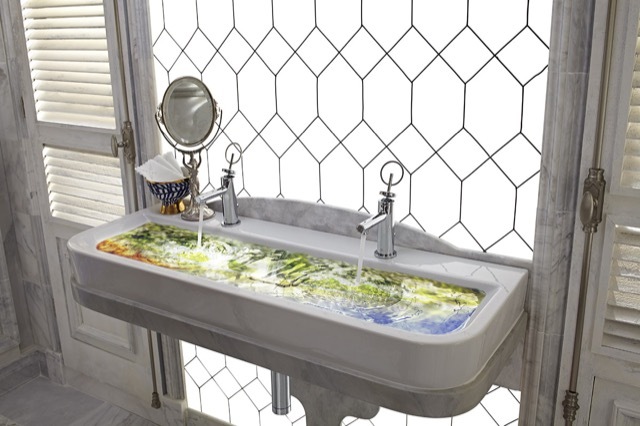 Justin’s nod to how conflicted Lucy feels: a lush watery composition of the English countryside in the sink of the Florentine-inspired bathroom. SH: Do you remember when you first read the book? JS: I read the novel shortly after seeing the film, as I believed there would be more within its pages than what could be conveyed on screen. This wasn’t necessarily the case, as Ruth Prawer Jhabvala, who wrote the screenplay, captured so much of the subtle nuances of social etiquette that ran so deeply through the novel that the film was as satisfying to watch as the story was to read. SH: Have you returned to the story over the years or do you tend to read a book once and not go back to it? If you have re-read it, have you had different responses to it at different times in your life? JS: I have re-read most of E.M. Forster’s novels. At each reading, I discover another thread or a moment I missed previously, and I look for more within the words and pages that corresponds to my changing interests each time. SH: Have you been wanting to use the premise of the story for a design project or did it just pop into your mind when you knew you were going to participate in this DXV project? JS: Merchant Ivory developed fascinating playgrounds in which the E.M. Forster novels could come to life and I’ve always admire that. During my first architecture job in New York City, the firm was working on a home in the Hamptons for clients obsessed with Howard’s End. I enjoyed studying their interpretation and I mused that perhaps I would have the opportunity to transpose A Room with a View architecturally at some point in my career. I studied for a semester in Italy, and could identify with Lucy having her heart and soul divided. Justin’s luxuriant accoutrements for Cecil’s space call to mind the well-heeled gentleman of his time. SH: What’s your favorite thing about how the vignettes turned out? JS: The lighting, as it was the primary motivator in the design for the two spaces. I used texture, color and pattern to further enhance the lighting, and the counterpoint between the two. The two vignettes had to be disparate with few parallels. Aesthetically, both needed to be rooted in the time of A Room with a View. SH: How do you think the vignette Lucy inspired would make her feel? JS: My hope is that she would identify her struggle between Cecil and George. 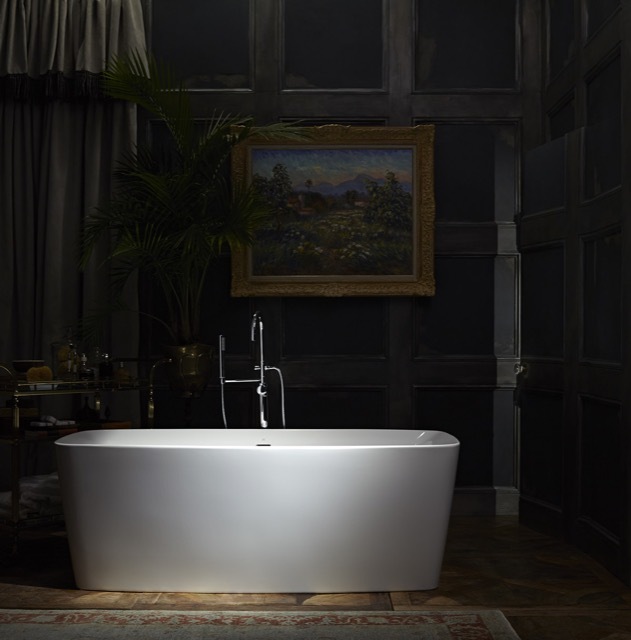 Cecil in the moody Edwardian vignette with the singular tub and the door slightly ajar beckoning curiosity as to what is beyond. 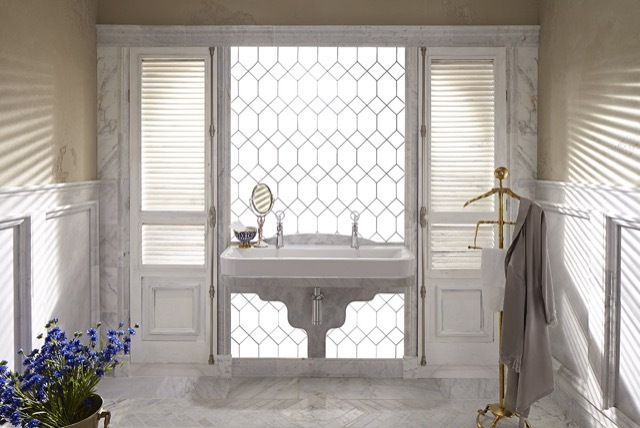 George in the bright Florentine vignette with the sun partially filtered between the slats of the shutters and the double sink with double rings of the DXV faucets foreshadowing a wedding. SH: How do you think George would feel when he walked into the space he was meant to share with Lucy? JS: I believe George would have a primal reaction to the Edwardian vignette as everything he loathes. He would gravitate to the Florentine vignette as the place where he met Lucy, fell in love and had their honeymoon. The bathtub with a view! 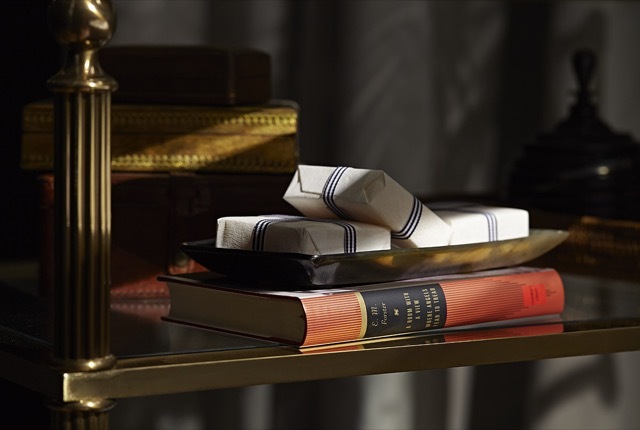 This time of Florence, representing a push-pull of emotional angst in the British-inspired vignette. SH: How do you think Cecil would feel when he walked into the space he inspired? George and Lucy outside the Basilica in Florence. You can visit Justin’s DXV Design Panel page to see all of the manufacturers whose products were used in his spaces, as well as the DXV fixtures he chose. In my opinion, Justin is well on his way to cementing a design legacy of merit, which Forster did so brilliantly in the literary realm. I salute American Standard for producing such a remarkable series each year—this novel idea is one of the finest examples of brand enhancement by way of noble cultural association I’ve seen. 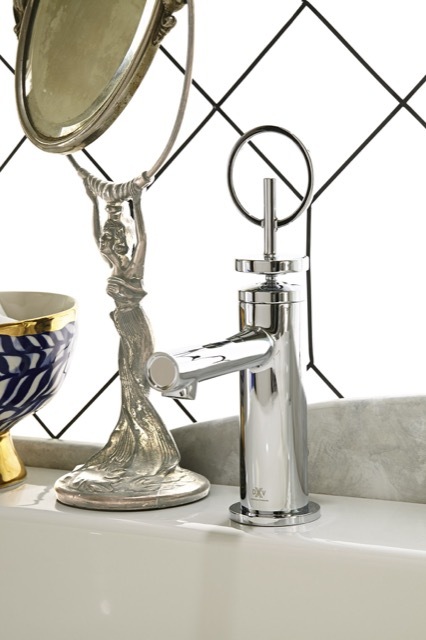 While on the DXV site, take the opportunity to learn about how the other designers approached their vignettes. Here are links that will take you right to their projects inspired by classic works of literature: Lori Gilder and Rebecca Reynolds, Lisa Mende, Tami Ramsay and Krista Nye Schwartz, and Regina Sturrock. 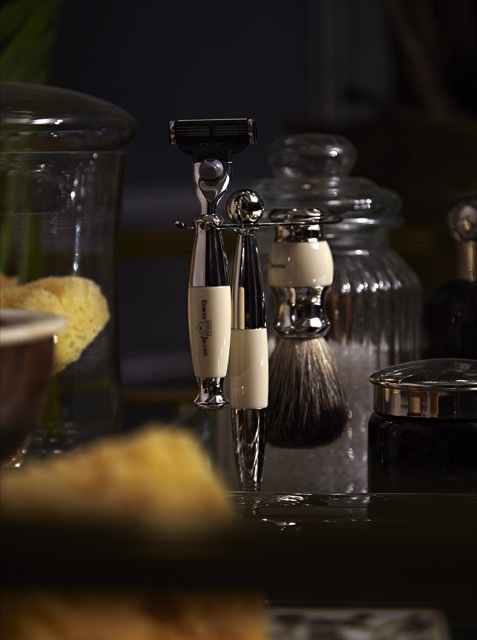 The space Lucy inspired holds luxe design references to her femininity and the formality of her era. This post by Saxon Henry, all rights reserved. Saxon is an author, poet and strategist. Her books include Anywhere But Here, Stranded on the Road to Promise and Four Florida Moderns. Thank you so much, Saxon, for this illuminating post about Justin and his thought and design process in designing the vignette for American Standard. 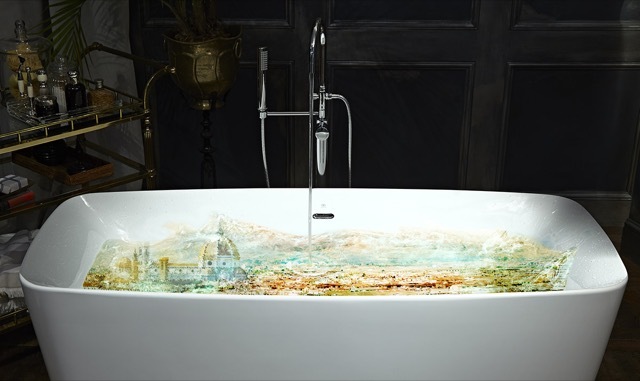 As a huge fan of A Room with a View, it is thrilling to see his artistic and beautiful interpretation of this story, and the Edwardian era, in this bathroom space. It was a treat to write about Justin’s process and design, Lidy. He is super talented and I have been following his rise on the design scene for the past several years since I met him at the Mercantainfiera in Parma. Thanks for taking the time out of your busy schedule to read my post and to comment. It means so much that what I write makes an impact!